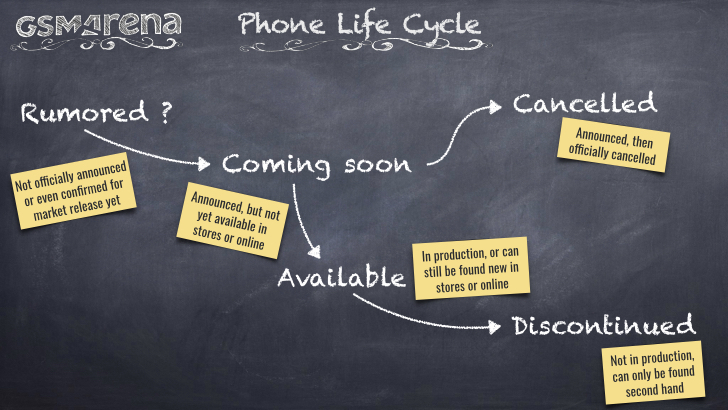 The stage of a phone within its life cycle as we report it within our Phone Specifications page here at GSMArena. There are five different stages to a phones life cycle. Not yet officially announced or even confirmed for market release yet. You'll notice that we're very enthusiastic on reporting on rumors for upcoming phone releases. If you've got a hot story to share with us, contact us here. Officially announced, then officially cancelled. Rarely happens. In production, can be found new in stores and online. Availability could vary by region though. No longer in production, can usually be found pre-owned online.